We’re thrilled to have blogger Katie Jacobs Styling My Everyday host our June blog all about party planning! Katie is a Franklin native and an expert on how to throw a party with local goods from our Downtown Franklin Association members. Check out her book, “So Much To Celebrate”, for more tips and tricks. Thanks, Katie! The first thing on my party to-do list is always dessert! Alena and her bakery team at Triple Crown Bakery can make anything you can dream up. From elaborate cakes to cute cupcakes—their creations are Pinterest-perfect. They also have a daily selection or breakfast pastries (sweet and savory) that would make a beautiful breakfast buffet. This adorable boutique has been my go-to for closet staples more than 10 years. Abby really does a great job curating the shop with sophisticated casual clothes that complete the perfect elevated everyday look. They also have some show-stopping party looks. I know I’ll always find something I love. This team of creatives has finally come to Franklin and boy am I in trouble! I adore all their paper table runners (I use them for wrapping paper too), place mats, and gift tags. They make putting together a super adorable party completely effortless (not to mention easy to cleanup). 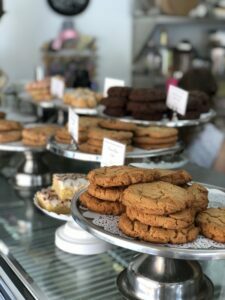 Tin Cottage’s new shop on Main Street is the definition of HAPPY. With bright colored gifts and treasures, there is a plethora of items to brighten your home. I love their little party section full of fun cocktail napkins and cake toppers. 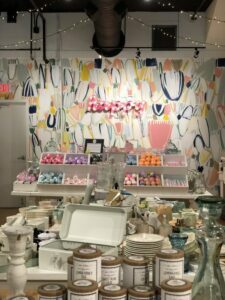 Their bath bombs and locally made cotton candy are sure to be killer party favors. This Main Street staple has always been killing the invitation game. Now, with the addition of their balloon bar, this little store has become a one-stop-shop for all things party. Get Lauren and her team to design unique custom invites and knock guests socks off with one of there totally-on-trend balloon installations. One of my favorite gift stores, White’s Mercantile, has your hostess gifts covered. I love their grocery section, perfect for compiling an extraordinary gift basket or to help make cooking for guests a little easier (I love the hot fudge and salted caramel sauces). Dishes and glasses and trays, oh my! Only the most exquisite selection of fine party essentials can be found at The Registry. 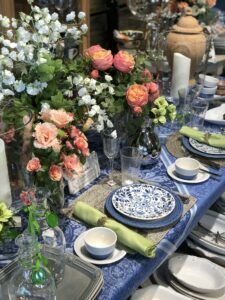 From hand-blown Juliska glasses to shatter-proof dishes, silk flowers to classic white cereal bowls, your home will look super sophisticated and party ready. To stay up-to-date on all the happenings of Downtown Franklin, sign up for our monthly roundup email, and be sure to connect with us on Facebook and Instagram! Tag all your social posts with #americasfavoritemainstreet and #dwtnfranklintn when out and about in Franklin shopping for your next party!